If you understand how different types of carpet fibres can handle everyday soiling, you will be able to recognise the changes in and needs of your current carpet; this information can also guide you if you choose to replace your existing one. There are a number of common fibres used in most carpets. Below, we will explore each of the 4 main varieties, including their response to everyday soiling. 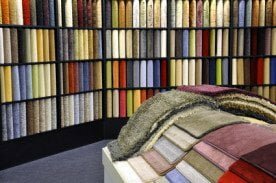 In use since the 1960s, nylon is definitely the most common and popular choice of carpet fibres; in fact, nearly 80% of all manufactured carpets are made of this material. The reason for this popularity is the material’s versatility. One of the most important aspects is the fact that nylon is not only durable and resilient, but also very receptive to colouring and dyeing. Furthermore, regarding texture, many of the newest forms of nylon are extremely soft and pleasant to the touch, more essential qualities of great carpets. In terms of its response to everyday stains, nylon is not stain-resistant, but there are numerous stain-resistant carpet treatments for nylon carpets that can effectively protect against serious damage from normal stains and spills. Polyester is another very popular carpet material, specifically because polyester carpets have an unmatched ability to retain vibrant colours over time, unlike other varieties, which have a tendency to fade. Polyester carpets are also non-allergenic and sustainable, as the material is commonly made from recycled plastic bottles. However, polyester is not a particularly resilient material, and tends to bend under pressure over time, resulting in large flat swaths of carpet in high-traffic areas. However, for aesthetic carpet design in low-traffic areas, polyester is exceptional. In many ways, polypropylene carpets are similar to nylon, particularly in terms of resiliency and softness. Although an olefin carpet isn’t as durable as nylon, it does have the added advantage of being more resistant to bleach and acid. Unfortunately, it attracts dirt and can often look soiled if it isn’t regularly cleaned. There are a few other disadvantages, including its inability to spring back quickly after compression, and its tendency to be matted down by excessive walking over time. However, despite those apparent disadvantages, the stain resistance and long-term potential makes polypropylene a contender in the material market, particularly in families with children or pets where regular cleaning is almost guaranteed. If you are planning on spending a lot of time walking around barefoot, then wool may be your best choice, as it is definitely the softest carpet material and is quite luxurious in certain design styles. However, the advantages may stop there. Low-grade wool is highly susceptible to staining, while the price point of high-grade wool puts it out of most people’s budget. Furthermore, it isn’t particularly durable and wears down quickly. Wool is very receptive to dyeing, but it also fades when exposed to direct sunlight, and is not resistant to mould or mildew. Manufacturers have created combinations of wool with other synthetic fibres that have the benefits of both.